RYA Competent Crew and navigation skills to level of RYA Day Skipper shorebased course or equivalent experience. A course for aspiring Skippers with some yachting experience and core navigation and sailing skills. Learn to skipper short passages with the instructor on hand to give advice and encouragement and ensure your safety. Experience being in charge, taking credit when it all goes well and being responsible when it doesn’t. This qualification is accepted in most parts of the world for chartering yachts. Preparation for sea, deck work, navigation, pilotage, meteorology, rules of the road, maintenance and repair work, engines, victualling, emergency situations, yacht handling under power, yacht handling under sail, passage making, tide, introductory night passage. Ability after the course: Skipper a small to medium size sailing yacht on short coastal passages. Certificate awarded at end of course: RYA Day Skipper (Sail). Please note: It is assumed that you are already proficient in the topics covered in the Competent Crew course syllabus, understand the basics of navigation, sailing, rope work, seamanship and have experienced at least 100 miles on a cruising yacht as an active crew member. It is not possible to successfully complete this course as a complete beginner. The Competent Crew course teaches you how to sail - The Day Skipper course teaches you how to plan and execute passages safely and manage a sailing yacht. 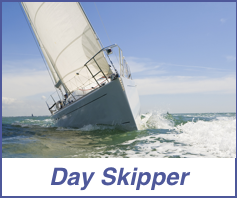 There is not time during a Day Skipper course to also teach all the essentials of sailing and seamanship.